cost Prices differ for each program starting from R235 per month. Young Engineers provide an engaging, hands-on learning platform. The educational goals are achieved by using K’nex® and Lego® assembly kits uniquely designed by our staff, demonstrating the scientific principles in a fun and accessible fashion; combining experiments that form scientific intuition with stories that capture the imagination. It is a fun and fulfilling method of teaching and learning children age 4 - 13. Our initiative has always been to establish an original and unparalleled education approach to assisting the engineers of tomorrow by creating engaging educational solutions early on. We always seek to offer every child in the world the opportunity and confidence to enter a challenging world by providing an encouraging, hands-on environment for developing the necessary skill sets. We combine Education and Entertainment= Edutainment. We provide weekly classes as well as holiday clubs and birthday parties. We believe the best way to educate children is through games. Games are tools that help children learn about themselves and the world around them. We believe that the conventional lessons, in which the teacher is dominant 85% of the time in class, don’t trigger enough interest and curiosity. Curiosity is the primary motive for studying. We believe that ESYE curriculums provide a new platform for children to construct; demonstrate and understand scientific principles by gaming experience; children understand that they need to get better in their learning material to become better in their gaming. We believe in knowing how to make the children like all learning materials, and properly communicate with the child so the subject would be absorbed efficiently. The course is intended for children 4-6 years old. Using flexible pieces to assemble 3D models, the Big Builders course aims to enhance motor skills, challenging the children gradually. The course will provide a hands-on educational experience - discovering basic engineering solutions. The course exposes children to engineering terminology, as well as terms taken from the animal kingdom, science and their current world. Children will develop self-learning skills, both in terms of building technique and knowledge. In addition, the children will develop communication skills while learning and playing with their friends. Course Structure: 5 -10 minutes: Theoretical explanation of the lesson topic and the model to be built. The explanation is accompanied by demonstrations and activities, such as social games, brainteasers, building games and more. 5 minutes: Playing with the model. 5 minutes: Dismantling the model and organizing the kits. Main Topics: • Basic Construction and Mathematical Terms: Shapes, etymology, polygons, parts of a whole, moveable vs. rigid. • Learning Abstract Terms: Imagination, friendship, belonging. • Learning Natural Processes: Camouflage, migration, pollination, biological pest control, cycle of life. Programme Objectives: • Broaden horizons and acquire extensive general knowledge about the world. • Develop fine and gross motor skills. • Develop interpersonal communication skills. • Encourage independent and creative thinking. • Develop a sense of self -efficacy and problem-solving capabilities. • Develop a sense of social belonging. • Develop skills for cooperative work and playing in groups. Target Audience: Ages 7 - 10 The main goal of the course is to illustrate content through stories and demonstrations. Our students will learn mathematics and physical principles through intuitive study, develop their independent learning and improve their building skills. The course will provide mathematical integration between physical laws and the simple calculations to support them. The laws and mathematics are both illustrated through the construction of exciting LEGO® models. Once the concepts have been demonstrated students enjoy hands on building the LEGO® models which provides experiential learning and reinforces the lessons topic. Course Structure: 15 minutes: Explanation of the model and introduction of lesson content. 10 minutes: Playing and improvements. 10 minutes: Model dismantling, kit arrangement and lesson summary. • Acquire theoretical knowledge in the fields of Science, Technology, Engineering, and Mathematics through experimental games. • Integrate theoretical material and scientific principles into a LEGO® based project. • Develop creative and inventive thinking among the students. • Develop the students' motor skills and spatial vision. • Develop skills for cooperative team work. • Basic and Complex Mathematical Operations: The integration between planning and building the model involves the calculation of energy transformations which enables the teaching of mathematical topics such as addition, subtraction and exponentiation. • Introducing Philosophers and Theoreticians: Archimedes, Newton, Da Vinci and many more. • Physical Forces and Laws: Centrifugal force, centripetal force, force of inertia, kinetic energy, potential energy, law of action-reaction, lift force, torque, leverage points, load distribution, force conservation, angular momentum and more. • Develop time planning and management skills. • Encourage independent creative and inventive thinking. • Develop the ability to analyze engineering processes. • Broaden knowledge of physical laws and various natural phenomena. • Develop a sense of self -efficacy. • Various means of transportation. 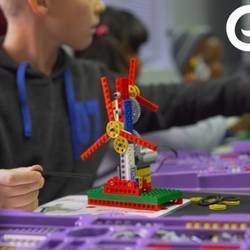 Target Audience: Ages 10 – 13 or Bricks Challenge graduates The "Galileo Technic" course offers broad knowledge in Science, Technology, Mechanical Engineering, and Math (STEM). Students explore machines from a professional engineering perspective, focusing on identifying solutions and promoting teamwork to build complex mechanisms. The programme provides an advanced level of thematic study, implementing mechanical engineering principles through building LEGO® based models. By analyzing physical, mathematical and technical aspects of a machine’s operation, students will implement the most efficient method for building their machine. The "Galileo Technic" programme utilizes the spiral learning method where students study a certain topic, investigate it from different angles and contexts while integrating the core processes frequently applied by engineers. This is an in-depth programme to extend the "Young Engineers - Bricks Challenge" programme; students will use expert level engineering thinking by considering the physical and mathematical aspects of building efficient machines. Course Structure: 10 - 15 minutes: Explanation of the model and introduction of lesson content. 40 - 50 minutes: Model building. 10 - 15 minutes: Playing and improvements. • Introducing students to new engineering terms while implementing all Bricks Challenge subjects. • The course will give a new overview of the following engineering mechanisms: Multi -channel transmission systems, mechanical coordination, the movement of a body on a rotational axis, canter of gravity and fulcrum, different ratchet implementations, energy depletion, recycling, limited transmission belt implementations. Statistics: probability, percentages and fair games, semi-automatic launching mechanism, parallel working, radar, axial steering, differential and differential lock systems. • Develop the ability to analyze engineering processes and Develop problem solving skills. • Acquire engineering implementation skills. • Broaden horizons and general knowledge of physical laws and various natural phenomena. • Develop sense of self-efficacy and Improve spatial vision. • Develop social connections, as well as communication and interpersonal work skills. • Acquire 21st century skills, including integration into modern lif e and high order thinking. • Complex machines, requiring high levels and teamwork.